Tracker Suite offers an integrated suite of business applications and solutions that work together to automate workflow and streamline processes. Our software provides the internal controls, reporting capabilities and transparency that federal legislation requires. The need for stronger internal financial controls has grown, particularly, the need for stricter Purchase to Pay (also known as Procure to Pay) processes. Businesses and organizations are now required to have in place stringent internal processes and controls that allow them to provide accurate and detailed procedural and financial reporting. And Tracker Suite's Purchase Tracker is our base module for our purchase to pay solution, from vendor relationship management to final invoicing and reporting of purchases. Purchase Tracker improves the PO number assignment, tracking and invoicing of approved purchase orders, while also enforcing strict approval routing of purchase orders with electronic signatures to track document activity throughout the process. In addition, Purchase Tracker provides a vendor database for better vendor relationship management. Purchase order forms are automatically populated with address and contact information after a vendor has been selected. Controlling Financial Processes: Tracker Suite offers applications for purchasing and expense reporting (Purchase Tracker and Payment Tracker, respectively), that establish and enforce legitimate approval processes, as well as generating audit trails for all financials. These applications integrate with Project Tracker, allowing purchases and payments to be tied directly to projects, tasks, account codes and cost centers, providing job costing and improving the accuracy of reporting as well. 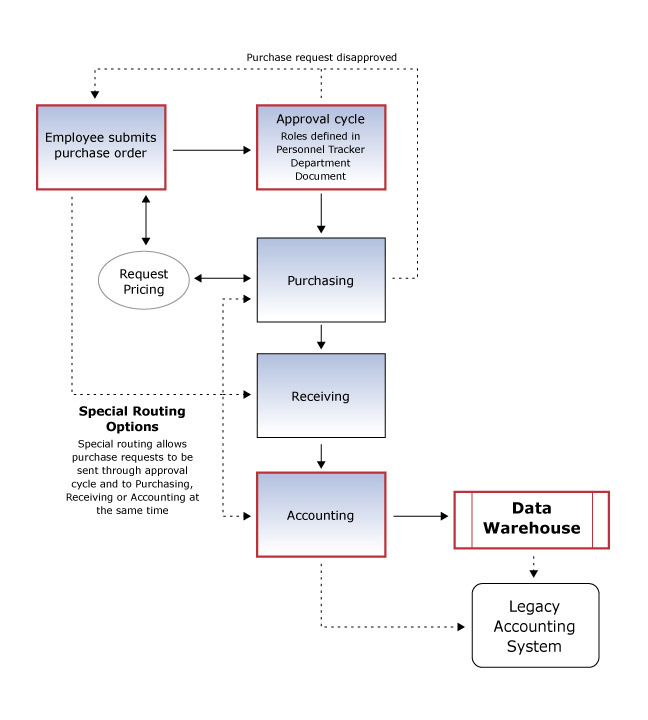 Detailed Financial Reports: When used in conjunction with the Tracker Data Warehouse, Tracker Suite can generate comprehensive financial reports based on the current data in both the Tracker databases as well as your legacy accounting systems. These reports can be used to track your organization's procurement costs and make effective decisions regarding future purchases.